Mollies Cottage in Chapel St Leonards sleeps 4 people. Mollie’s Cottage is a single-storey barn conversion located just a 10-minute walk from the sandy beach at Chapel Point. This delightful property boasts an enclosed garden complete with a private hot tub, perfect for relaxing in after a busy days’ adventure. 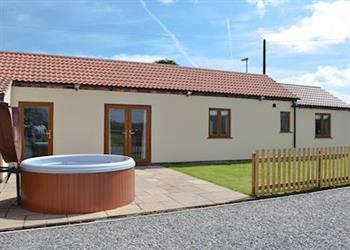 It makes a great base for a family holiday and is situated on a popular stretch of the east coast, between the seaside towns of Skegness and Mablethorpe, and Anderby Creek is just a short drive along the coast. Hardy’s Animal Farm, Fantasy Island and a seal sanctuary are all within a short drive. Outdoor pursuits nearby include horse riding, fishing, golf, good walks and cycle routes. Some areas of the beach are dog friendly. The beach is ¾ mile. With the shop, pub and restaurant ½ mile from Mollies Cottage in Chapel St Leonards. Mollies Cottage is all on ground floor: Living room with patio doors/kitchen with breakfast bar. 2 bedrooms: 1 double, 1 twin. Bathroom with shower over bath and toilet. Gas central heating, electricity, bed linen and towels included. Travel cot and high chair on request. 38 Freeview TV. DVD. iPod dock. Gas hob. Electric oven. Washing machine. Wi-Fi. Enclosed lawned garden with patio, sitting-out area and furniture. Barbecue. Parking (3 cars). Cycle store. Hot tub. Welcome pack. No smoking. Holidays at Mollies Cottage run from Friday to Friday. Pets allowed at Mollies Cottage. For a better idea of where Mollies Cottage is, you can see Mollies Cottage on the map below. Mollies Cottage is in Lincolnshire; should you be on the lookout for a special offer, you can find all the special offers in Lincolnshire. It's always worth checking to see what is on offer at the moment. Do you want to holiday near Mollies Cottage (UKC167), you can see other cottages within 25 miles of Mollies Cottage; have a look to find your perfect holiday location.